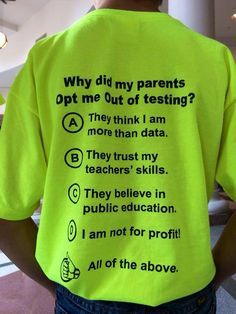 Could it be that administrators in Oregon are starting to question the value of high-stakes testing like the time-wasting and expensive Smarter Balanced Assessment and lousy test-and-punish policies? With passage of the Every Student Succeeds Act (ESSA), Oregon has a unique opportunity to reassess and improve our system of student assessment and school accountability. The prospect of regaining our reputation for innovative and effective student assessment systems is once again within reach. We applaud ODE’s efforts to quickly begin an inclusive process to guide Oregon’s response to its new opportunities and responsibilities under ESSA. We would like to join in an open dialogue with school district superintendents and other educators across our state about how we can best assess student learning and impact student achievement. As the leaders of some of Oregon’s largest school districts, we are keenly aware of the importance of student achievement data. We value the information provided by valid, reliable, standards‐aligned assessments that are administered consistently to all groups of students in order to provide critical information to educators, parents, students and the public about our students’ knowledge, skills and learning needs. However, our current statewide assessment system carries high costs in instructional time, impact on graduation preparedness, and student and educator attention all of which detract from the benefits of the system. We ask that serious consideration be given to replacing the current 11th grade state assessments with a standard college‐entrance exam such as the SAT or ACT. Oregon currently sanctions these tests to meet student graduation requirements, but does not include them in school accountability systems. Some states already have made this change with the approval of the U.S. Department of Education, and others are considering following suit with passage of ESSA. We acknowledge that changing the standard high school exam to a college‐entrance exam would require careful consideration of these assessments’ validity to measure progress toward Oregon’s Essential Skills and college and career readiness standards. However, such a change could carry numerous benefits. The amount of testing students undergo in their junior year is a serious concern. Many students in 11th grade complete the Smarter Balanced Assessment, OAKS Science, AP, IB, SAT and ACT tests, in addition to numerous dual‐credit exams and teacher‐created assessments. For the students who already take the SAT and/or ACT, completing additional state tests can seem redundant, contribute to a sense of over‐testing, and further reduce motivation and instructional time. Designating the SAT or ACT as the statewide high school exam would decrease time spent on testing, open doors of opportunity, improve equity, and contribute to creating a college‐going culture aligned with Oregon’s 40‐40‐20 goal. We believe that this change would be in the best interest of Oregon’s students—especially for students who may not otherwise complete college entrance exams. This opportunity for reflection on assessment and accountability systems may also create space to consider whether current assessments are effective tools for measuring Oregon’s Essential Skills for an Oregon Diploma. This is also an opportunity to consider Oregon’s nine Essential Skills adopted almost 10 years ago. It may be the right time to review their alignment to state standards and the methods we use to ensure students are able to demonstrate Essential Skills prior to graduation. As discussions progress in ODE’s workgroups, we also ask for thoughtful consideration of the most appropriate and effective assessments for grades 3–8. While the Smarter Balanced assessments improve in many ways on the previous OAKS exams, the new tests are lengthy and complex to administer. They require cumbersome and lengthy training that commandeers valuable professional development and teacher collaboration time which otherwise could be focused on meeting student needs, improving instructional practices, enhancing student engagement techniques, and advancing equitable systems in our schools. There are assessments in existence that correlate well to the Smarter Balanced Assessment and also provide information to teachers and students in a far timelier manner. Perhaps an ideal statewide summative assessment would take less than an hour to administer, it would align with state standards, align with and provide for a balanced system of formative and interim assessments that could inform instruction throughout the year, and validly and reliably measure student learning, all while minimizing the amount of instructional time devoted to testing rather than learning. We believe that this ideal is possible to achieve. We do understand that the timeline and passionate concerns regarding statewide assessment systems make this new opportunity a “heavy lift” for ODE. We would appreciate the opportunity to continue discussing options to support your efforts to adapt to the changes under ESSA. We also may be able to support the work of ODE by convening a separate, but inclusive, “think tank” to provide thoughtful recommendations to ODE, the State Board, the Governor’s Office, the Legislature, or other interested parties. The changes brought forward by ESSA offer tremendous opportunity for our state, our schools, and our students. We can improve on our state’s system for student assessment and school accountability. We can consider measures of student engagement, college credit attainment, family participation and more in our accountability systems. However, addressing the constraints of our current assessment model is a first step. Please consider how we can help support the development of a new plan that can make Oregon a leader in the field once again.